We left NYC just before our invitations to the Veuve Clicquot Polo Classic arrived. Drats. Who would’ve guessed, polo in the midst of the city, with fancy attendees acting out a great scene from Pretty Woman, by stomping-on-the-divots during half time. Plus a plethora of pretty faces, some of them Royal. And perhaps here’s an example of sons improving on the fathers. We might call this the Tale of Two Princes. 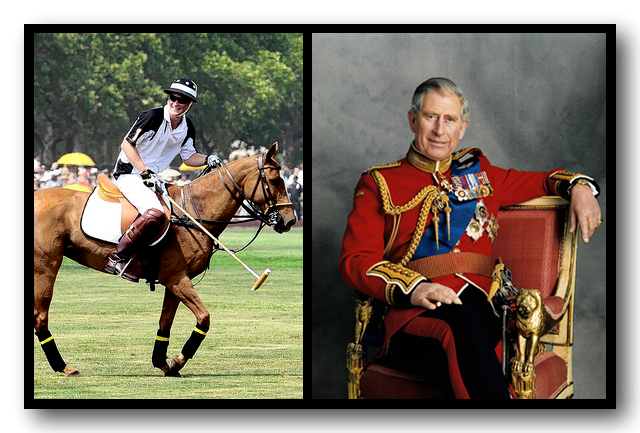 HRH Prince Charles (on the right) has lately acquired the habit of saying silly things and promoting silly causes. In a radio address … Prince Charles called for a return to spirituality as a guiding philosophy for human endeavors, with an associated downplaying of technology and science. He warned of the dangers of unrestrained scientific research and the perils of “tampering” with nature. He was inspired to pen these thoughts during a recent pilgrimage to a remote Greek monastery. HRH Prince Harry (on the left) appears to be doing better, at least in his choice of causes. The Veuve Clicquot Polo Classic will once again benefit the American Friends of Sentebale, a charitable organization founded by HRH Prince Henry of Wales and HRH Prince Seeiso of Lesotho, who are committed to transforming the lives of the orphans and at-risk children in Lesotho, Africa, many of whom are living with HIV/AIDS. Nearly one third of Lesotho’s population is infected with HIV/AIDS, and through Sentebale’s thoughtful and effective work, the organization is striving to affect positive change in the country. No matter how you cut it though, they both seem to be doing better than the rest of us. Horrible equitation….heels up? ?…it’s supposed to be toes up! And who ever saw a puppet hanging from a string in that position. No wonder he fell off! I don’t know beans about “equitation”, sounds like some nerd thing. My favorite were the cuffs on the horse. Are those his school colors? Oh…I feel a horse nerd lesson coming on! Those are called splint boots to protect his delicate legs when he kicks himself running around like a crazy person….or rather horse!